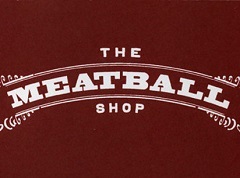 Under a tongue-in-cheek “Newsflash” headline and sub-hed ‘My Loins Are On Fire,’ Ortile slavishes manly praise on Michael Chernow, one half of the duo that owns New York joint The Meatball Shop. To fully complete Operation Must Sit Down, he plumbs the man’s workout regimen, Instagram account and J. Crew sideline gig. The BuzzFeed tags for Ortile’s item are michael chernow, chefs, hot guys, restaurateurs who can get it, the meatball shop. But the author forgot one: lusticle. We’re not talking about the urban slang definition. Rather, we mean this me-and-U variation spun today off of BuzzFeed’s most famous contribution to journalism. P.S. At press time, only Ortile’s article resides in the tag file restaurateurs who can get it. 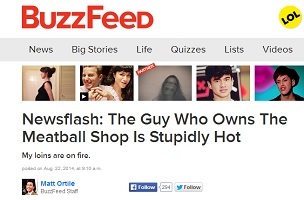 So c’mon, fellow BuzzFeed-ers… Think of a similarly hot restaurant-bar hunk/babe and let that lusticle rip!